LED grow lights are technical wonders. They produce very intense light while using less electricity than fluorescent and incandescent lights. While they weren’t as efficient when they were first introduced, they have changed a lot over the years thanks to technological advancements. In days gone by, many growers used them together with HPS and HID lighting systems. This is no longer the case. You can now use the lights exclusively because they are extremely powerful and produce excellent results. 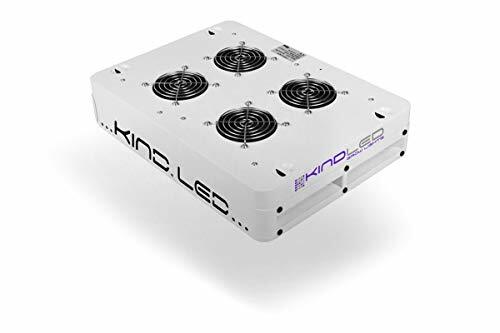 One manufacturer that’s always focused on producing top-notch LED grow lights is Kind LED. We think it’s because the company was formed by seasoned growers who were growing plants indoors long before there were LED grow lights. 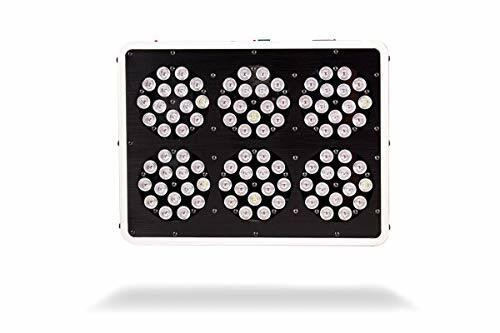 It focuses on continuous research and development to ensure that each light it produces is better than its predecessor and gives growers exactly what they need. 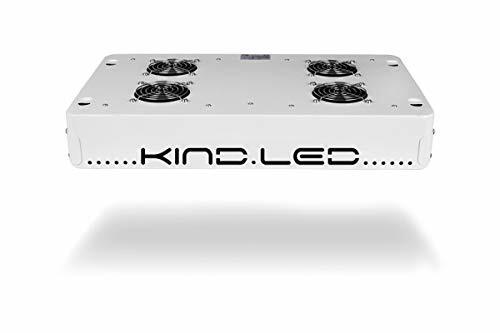 Kind LED has its headquarters in Santa Rosa, California, and sells grow lights on e-commerce sites as well as on its online store. 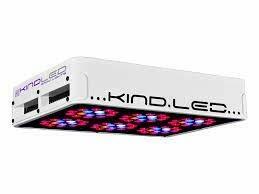 We’ve selected 6 Kind LED grow lights that will make your grow operation a success. All have a long lifespan and are built using high-quality materials. For the best results, choose the one that’s perfect for your indoor plants and provides enough light for your grow bed. If you want strong and healthy plants, you need a grow light that’s as powerful as sunlight. 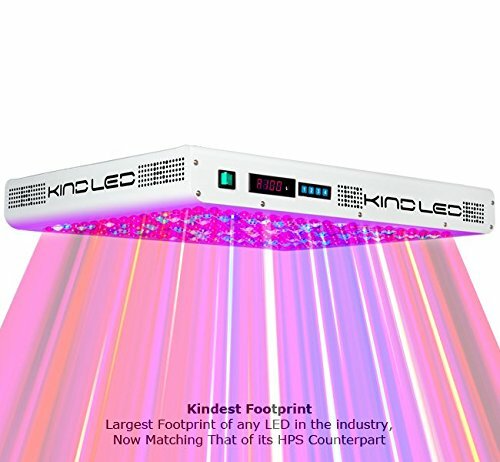 The Kind K5 XL1000 Grow Light is one such light. The award-winning light has been specially designed to improve your plants’ growth with the least amount of power usage (it only needs 630 watts to deliver 1000 watts). 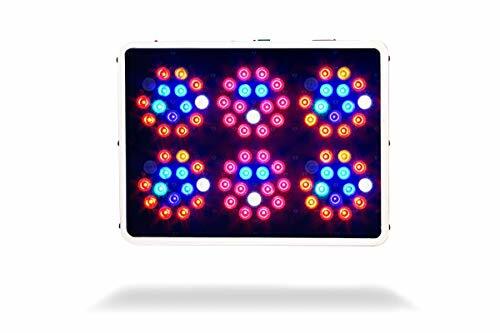 The grow light provides enough coverage for 4 plants during the flowering stage and 5 plants during the vegetative stage. Its large footprint makes it ideal for serious growers. You will love the light's fully customizable spectrum that is ideal for almost any type of indoor plant. 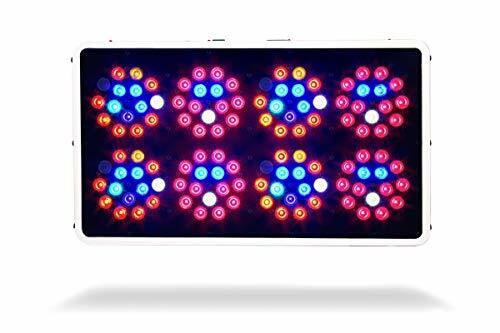 Unlike other LED grow lights that have digital timers – which can be unreliable at times – it has an internal timing function. Its highly useful remote allows you to remotely control all functions. However, we’re rather disappointed that the manufacturer didn’t use LEDs made by well-known brands. EXTRA LARGE FOOTPRINT solves one of the main problems that LED lights have faced in the past. INTERNAL TIMING FUNCTION of the K5 series lights allows for more streamline setups where the user can do away with separate analog or digital timers that can be bulky and extremely unreliable. You'll be delighted by the fact that this light emits 750 watts and only draws 430 watts at most. It uses powerful 3W and 5W diodes to produce all the light your plants need. 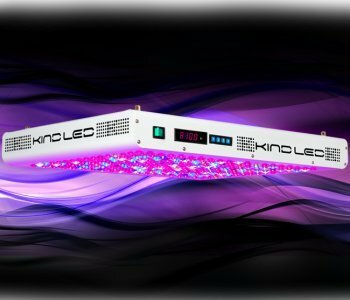 While the 5-watt diodes draw more electricity and produce more heat, the grow light doesn't overheat thanks to its internal cooling features. Each of the diodes is individually lensed to intensify the light output and significantly boost PAR and canopy penetration. 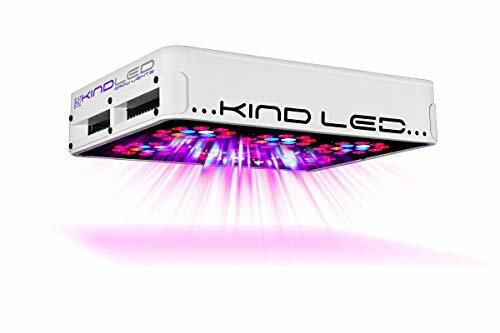 This light is awesomely designed and boasts features that other grow lights in its class do not have. It gives you the freedom to adjust the light spectrum and intensity and has a remote control and a built-in timer. You can make the light dim or intense to give your plants the perfect spectral output from seedling stage to harvesting. But the light has one major downside, its remote control may stop working after a few months. 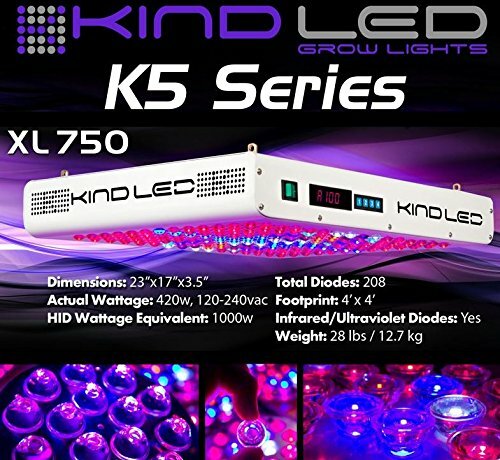 One of the most innovative lights by Kind LED is the K3 L600. There isn’t enough room here to explain each benefit of this light, so we will focus on its most important features. First, the light runs at 90% efficiency, meaning it uses every single watt of electricity it draws to supply your plants with energy. It also consumes about half the power HID and HPS lights consume (320 watts maximum). Secondly, the light has an extra optical lens that enhances canopy penetration by as much as 200%. Thirdly, the light can last 100,000 hours without losing its efficiency. Its brilliant efficiency and long lifespan will save you a good amount of money in the long run. While some LED grow lights don’t do a good job of replicating the light the sun produces, this one does. Yes, it is a bit pricey for the coverage it offers (3' x 4'), but we think it’s worth every cent. Finding the perfect grow light for your plants isn't as easy as it seems. New grow lights with advanced features are being made every day, and this only makes things more difficult. That’s why it’s always important to know the nitty-gritties of a light before getting it. 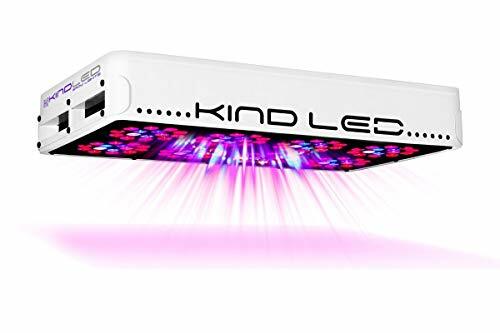 The K3 L450 is one of the popular lights by Kind LED. It has a 12-band spectrum that is ideal for all phases of plant growth. Its heat sinks and quiet fans keep the temperature low and ensure plants do not wilt or suffer from heat damage. They also make sure that the light runs cooler than its counterparts. Since the unit is also quiet, you don't have to find a secluded spot for it at the back of your house. The only thing you may not like is that it does not provide good coverage (only 2.5' x 3.5'). However, you can get a bigger light for the next growth cycle. While this light doesn't generate a lot of watts and is only ideal for a small grow operation, don't make the mistake of thinking that it isn't powerful. In fact, it is one of the best lights in its league. It uses a 700mA driving current to produce as much light as a traditional 300W HID system, enhancing plant growth and yield. The intense light it gives off provides the right PAR. PAR is very important for plant growth, the higher it is the better plants grow. 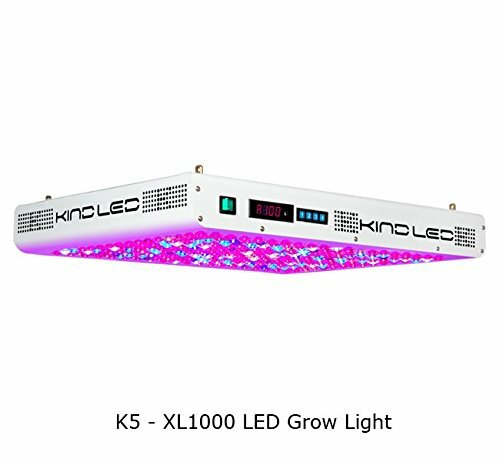 The K3 L300 uses 3-watt LED chips but they don’t run at full capacity to ensure they last long. 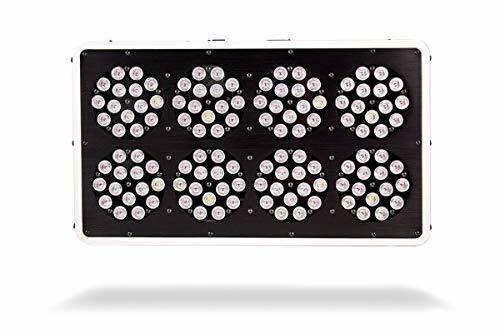 Like the other lights we've reviewed here, it has a 12-band spectrum which ensures plants grow indoors the way they would grow outdoors. The light comes with ratchet hangers to make installation easy. However, its fans are not very strong, and some may stop working sooner than expected. While there are numerous things to consider when getting a grow light, we always recommend looking at the spectrum, the coverage, the electricity a light draws, and the watts it delivers. Some lights are very powerful but don’t provide good coverage. Your budget is also an important factor as it will dictate the light you buy. Our favorite light here is the Kind K5 – XL750 because it balances price, coverage, and wattage. However, consider your needs first before getting it. It is also worth noting that Kind LED lights are UL Listed. They have been tested and meet UL’s nationally-recognized standards for safety.